I haven't done this walk for about 20 years. 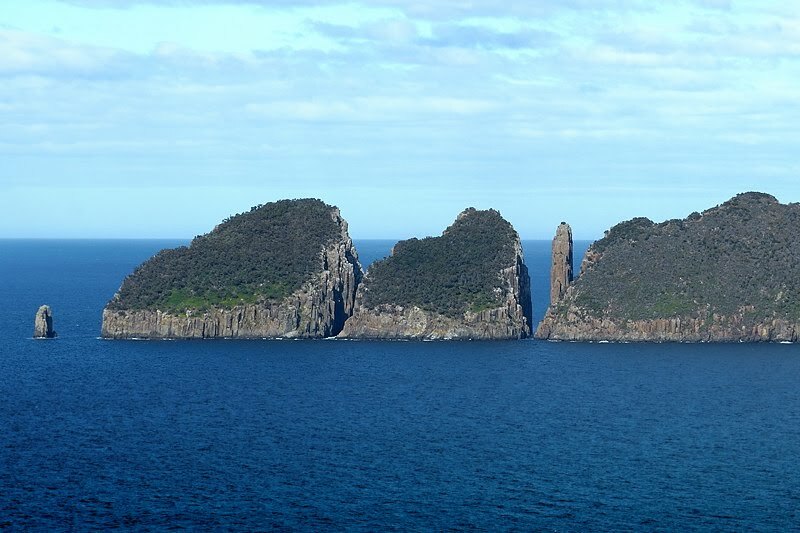 It's normally labelled as Canoe Bay and Bivouac Bay, which are passed along the way, but the aim should be to walk on beyond Bivouac Bay and up onto the cliffs just north of Dolomieu Point, which give grandstand views of the rocks at Thumbs Point and Cape Hauy. 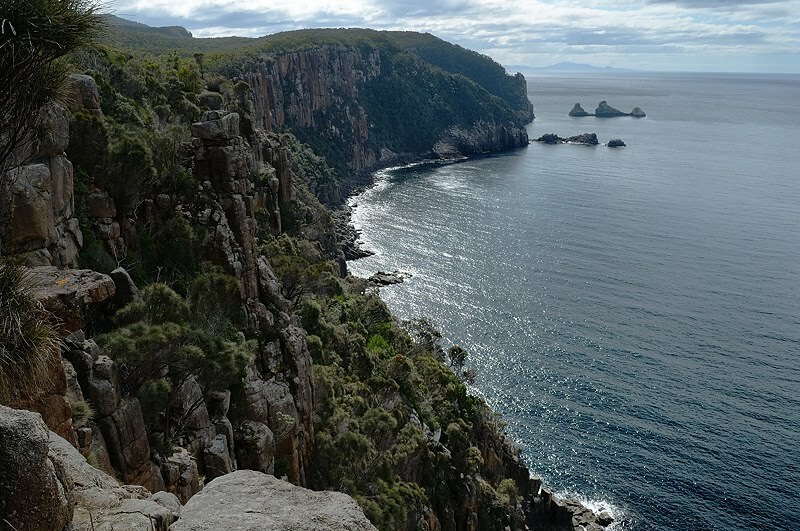 The walk starts at the Fortescue Bay carpark, and heads north along the beach. The creek flowing from Fortescue Lagoon has been flowing strongly with recent rain, and may need to be waded. (On the return it was nearly narrow enough to jump given the lower tide.) At the north end of the beach, the track climbs a little into the forest. The walking is easy and pleasant, and the track meanders through the forest for a while before descending to Canoe Bay. 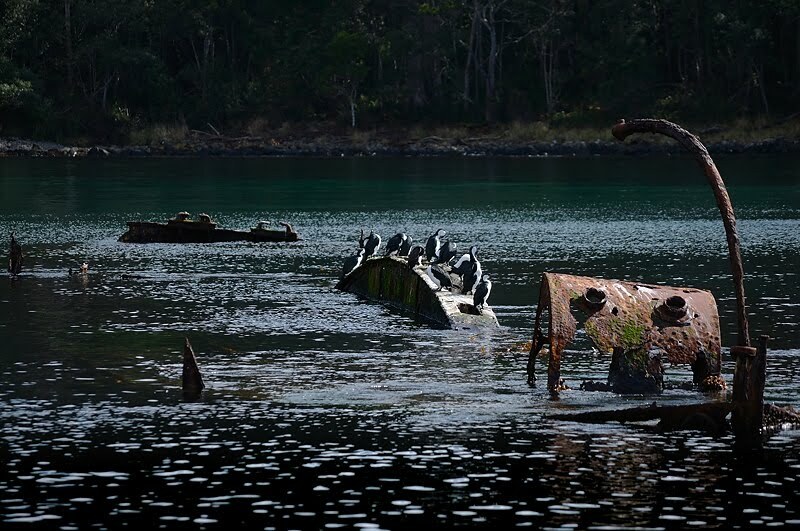 Here a sunken steel boat now serves as a large perch for cormorants, but is said to have been a breakwater for fish processing works which formerly operated here. A very rough 4WD track (Canoe Bay Track on the 1:25,000 map) intersects the walking track just before it arrives at Canoe Bay. This track apparently heads off uphill and joins Fortescue Road. The track continues beyond Canoe Bay, crossing the substantial creek on a good suspension bridge, and contouring around the north side of Canoe Bay. The track then climbs about 110m quite steeply over the headland and descending again to Bivouac Bay. Here there is a toilet and camping area, with water available from the creek - apparently permanent. 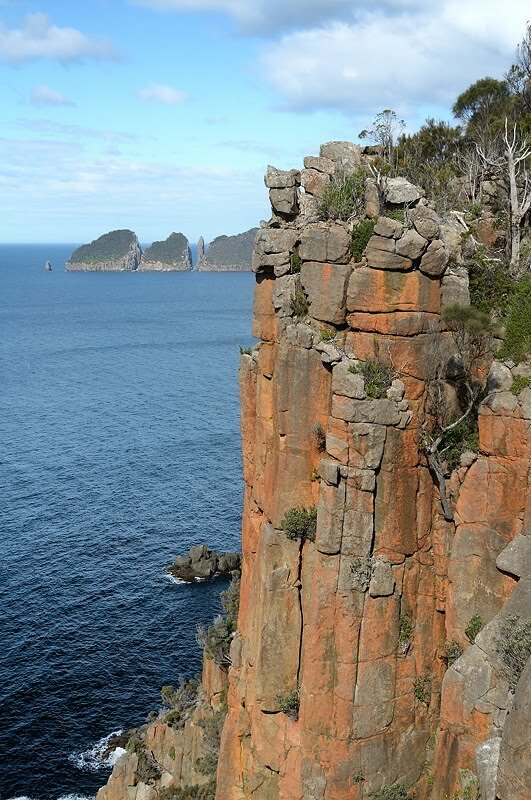 The track then continues around the head of the bay across the creek, and climbs 100m to cross Dolomieu Point and emerge on the cliffs just north of the point. There are several good lunch spots within a few minutes of the top of the hill where you can sit on flat rock at the edge of the cliff with spectacular views. This climb at the end is very well worth it.